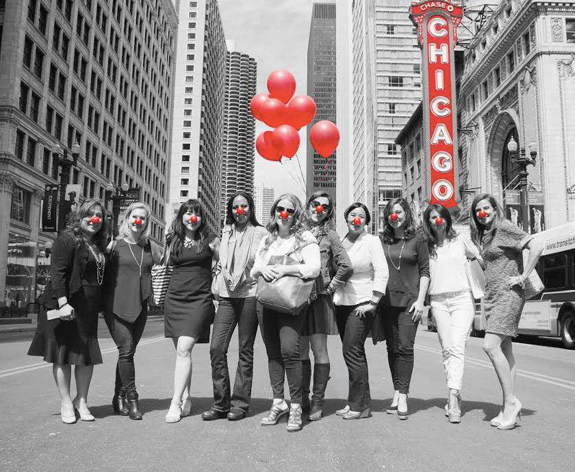 I have seen time and again how small actions can contribute to big change, so when I was invited to cover (in a sponsored capacity) the Red Nose Day launch event at Walgreen’s in Chicago last week, I was thrilled! A U.K. tradition for over 25 years, Red Nose Day is a comedy fundraising event coming to the U.S. for the first time via a live show May 21 on NBC. The event benefits 12 U.S. and international charities that work to help lift kids out of poverty. And the super awesome thing? It's ridiculously easy to help the effort! Simply buy a Red Nose for $1 at Walgreens (the exclusive retail partner for the event) and proceeds will go to the Red Nose Day Fund. EASY PEASY! Last week, our team witnessed the sale of the first Red Nose at the flagship Walgreens in Chicago (which, by the way, was crazy amazing – smoothies! sushi! wine!). I wore my nose as we jaunted around downtown Chicago, and I’ve gotta say, it was incredible how the simple act of wearing a nose made me laugh and made others laugh too. Here's a shot of our media team stopping traffic in Chicago! Finally, there’s another cool thing that Walgreens is offering. Share your red nose photos using the hashtags #Walgreens, #RedNose, and #promo, and you’ll have a chance to win a trip to New York City to attend the Red Nose Day star-studded event on May 21. So go on and share -- I can’t wait to see your pictures! Sorry, one more thing! This video offers a quick introduction to our media team and why we're passionate about Red Nose Day. Enjoy! Disclosure: This post reflects a compensated editorial partnership sponsored by Red Nose Day at Walgreens. All opinions are, of course, my own!